To me, art is a form of problem solving, introspection and reflection. As the late, great Jean-Michel Basquiat once quoted, "I don't think about art when I'm working. I try to think about life." Whether using oils, colored pencils or inks, I am at my most meditative state while executing intricate details and blending elements that, much like a sculptor working physically with clay, are continuously shaped and altered by my thought processes until clarity is achieved and all the elements begin to fall into place. Art and creativity have always been encouraged within my family, so I grew up drawing and imagining my way through childhood. My most formative years were spent, as millions of other eighties-era children, plopped in front of the television set, watching animated programs like He-Man, Teenage Mutant Ninjas Turtles, Transformers and so many others. Saturday morning cartoon infatuation soon turned to video games and comic books and by the time I was in high school, my life was filled with hip hop and skate culture. 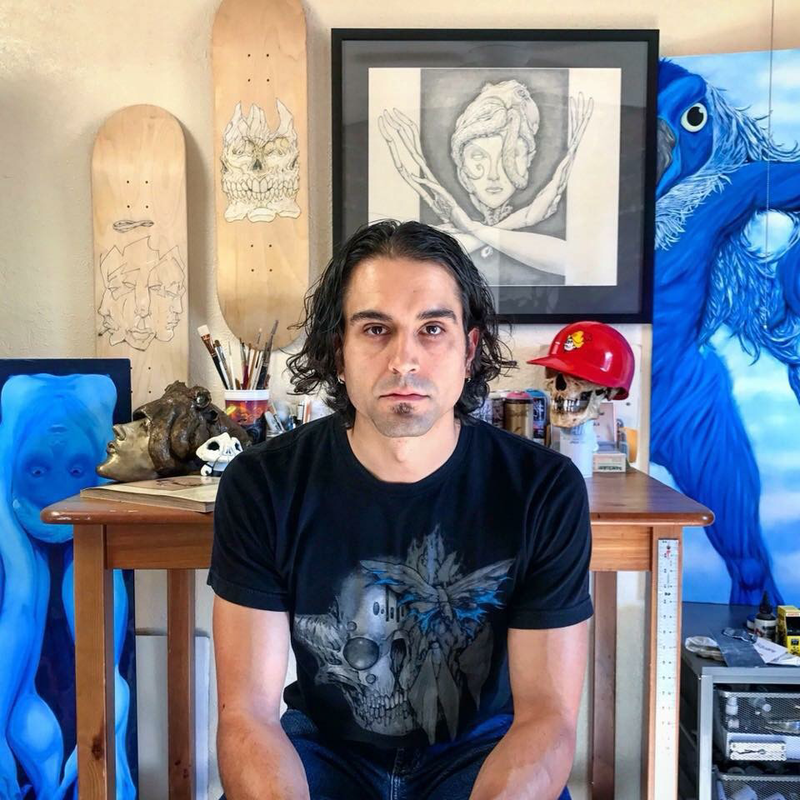 Completely awestruck by the bold characters, tangled lettering and explosive colors of graffiti artists and graphics designers, I soon realized that the these influences, no matter how subtle, would forever find a place at home within my art. I am interested in the methods by which images and colors are composed together to evoke emotion. My latest works focus on a sort of disquieting interaction between the viewer and the exaggerated bodies of my subjects that are suspended in and sometimes overwhelmed by their surrounding environments. The figures are composed with twisting, elongated limbs and bold, unavoidable gazes against ambiguous backgrounds. Treated with particular and mostly monochromatic color schemes to set the mood of each piece, they are executed in a manner in which the images, from afar, will pique the interest of the viewer, beckoning to be drawn closer and treated to fine detail and brushwork, but leave with an overall impression that remains curious and unsettled.